Drinking fruit juice can be a good way to get one or two servings of fruit into your day and increase the amount of antioxidants you consume. Fruit juice can be high in calories, so it's important to watch your serving size, especially if you are watching your weight. It's important to go for 100-percent fruit juice rather than soft drinks made with fruit juice because that makes it easier to get better nutritional value and not just empty calories. Orange juice is probably the best option because it's nutritious, easy to find and not as expensive as more exotic juices. It's high in vitamin C, folate and minerals. In fact, one cup of orange juice provides all the vitamin C you need for one day. Why is vitamin C so important? It's essential for strong connective tissue and healthy blood vessels. Vitamin C is also needed for normal immune system function. Orange juice is also high in potassium that helps counteract sodium to regulate blood pressure and body fluid balance. It's also needed for muscle and nerve function. 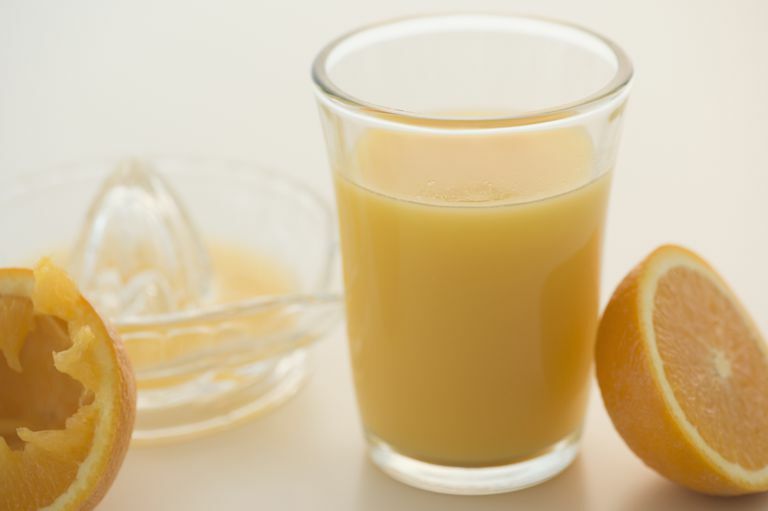 Drinking orange juice also gives you folate, a B-complex vitamin that's good for heart health, blood cell production, and to help prevent a birth defect called spina bifida. Orange juice is also a good source of magnesium and if you want, you can purchase orange juice that's been fortified with calcium to make it even more nutritious. Pomegranate juice is another excellent choice because it's high in potassium, magnesium and B vitamins. It's also a good source of calcium and antioxidants, but it contains very little vitamin C. Pomegranate juice is also high in antioxidants called polyphenols that may help maintain healthy blood pressure. It has a few more calories than a similar sized serving of orange juice with about 135 per cup. Pink grapefruit juice is also good for your diet as long as you choose juice that's not sweetened with extra sugar. It's almost as high in vitamin C as orange juice and has plenty of minerals and it's also a good source of vitamin A. White grapefruit juice doesn't have the vitamin A, so pink grapefruit is the better choice. A cup of grapefruit juice has less than 100 calories. The worst fruit juices are fruit juice drinks like Sunny D and Capri Sun Fruit Punch. These beverages may claim to be 'made with real fruit juice' but only contain a small amount of juice and are mostly water and sugar or corn syrup. As a result, they don't have much nutrition. Be sure to read food labels and ingredients lists and choose 100-percent fruit juice. Most fruit juice is sold in bottles or cartons and will need to be refrigerated after opening (some will need to be refrigerated right away). Frozen juice concentrates can be kept in your freezer for several months until you're ready to add water and serve. You can also make your own juice with fresh fruit at home. Fresh squeezed orange and grapefruit juices are easy to make with a manual juicer. All you need to do is wash your fruit, roll it around on the countertop while applying pressure, and then cut the fruit in have and use the juicer. If you have a high-speed blender or electric juicer at home you can make most any kind of fruit juice (and it's extra healthy if you leave the pulp in the juice). Are juice blends as good as single juices? They're fine as long as the only ingredients are juice. However, sometimes more expensive juices like goji, açia or pomegranate juice are mixed with a cheaper juice like grape or apple juice, so you may not be getting a full serving of the specific juice you're looking for. Will drinking fruit juice make you gain weight? Many fruit juices are high in calories so if you drink them without keep track of your daily calorie intake you might gain weight. That doesn't mean the fruit juice calories will make you gain more weight than calories from other foods. It does mean that you're consuming too many calories. If that's the case, cutting back on fruit juice to just one serving a day may help, or better yet, choose fresh fruits that have all the nutrition but fewer calories and more fiber. Is fruit juice good for kids? It's okay to give fruit juice to kids over the age of 6 months, but only in a cup and not a bottle (to help prevent dental cavities). Younger kids should only have a few ounces per day. Asgary S, Javanmard S, Zarfeshany A. "Potent health effects of pomegranate." Advanced Biomedical Research. 2014;3(1):100. Dietary Guidelines for Americans 2015–2020 8th Edition. 2015-2020 Dietary Guidelines. Hyson DA. "A Review and Critical Analysis of the Scientific Literature Related to 100% Fruit Juice and Human Health." Advances in Nutrition: An International Review Journal. 2015;6(1):37-51.